Another pair of “Toast” mitts, these in Funky Carolina handspun merino dyed up in the “Dollie” colorway that I spun earlier this summer. 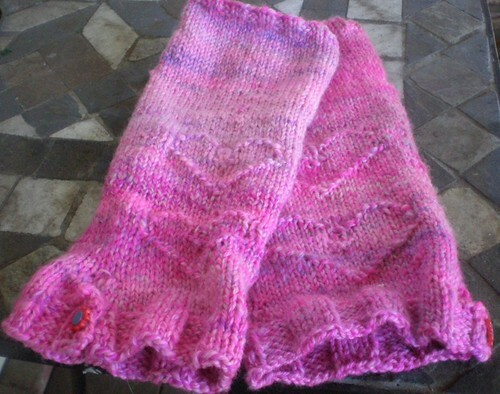 Some mods included a purled heart motif, cute flower buttons, and ribbing to keep the edges from curling. 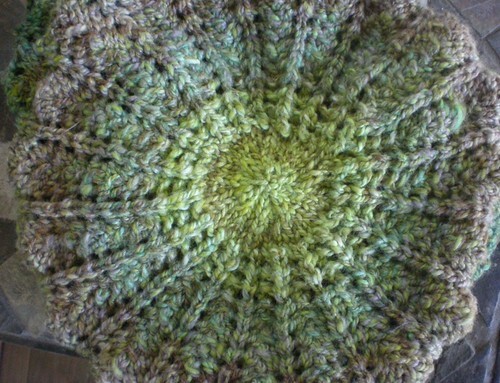 It reminds me of a wheel or a mandala and might be my favorite hat ever, not just of the most recent finished goodies. Knit up in handspun (also Funky C) merino/silk, in the “Greensleeves” colorway. School continues to eat my brain. Which is probably better than zombies. If it were zombies, I’d be complaining. I hear you about school! I only take 2 classes at a time but they’re accelerated so I have new classes every 10 weeks. I was doing just fine till biology came along… now, I’m not so sure. Love the hat, but the “Toast” mittens are calling me. 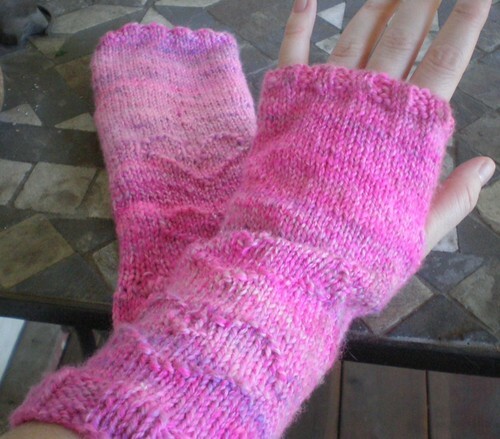 I would love some of those to warm my hands on a cold winter day. They are beautiful. Those mitts are adorable and I must have some!